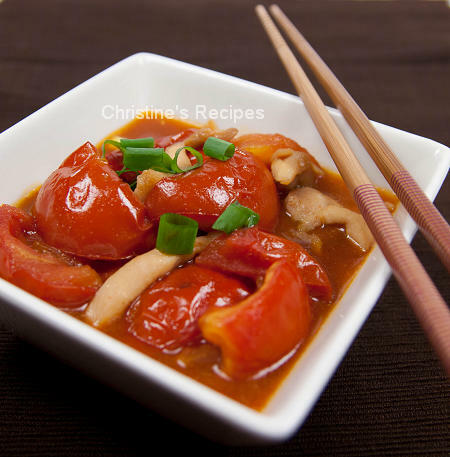 This is my favourite tomato dish that I learned from my mum. It's a Chinese popular dish in Hong Kong. My mum used to add an ingredient to make the tomatoes taste even better. It’s a kind of homey dish that many kids like to have with rice. “This carotenoid found in tomatoes (and everything made from them) has been extensively studied for its antioxidant and cancer-preventing properties. The antioxidant function of lycopene-its ability to help protect cells and other structures in the body from oxygen damage-has been linked in human research to the protection of DNA (our genetic material) inside of white blood cells. Prevention of heart disease has been shown to be another antioxidant role played by lycopene.” – from “Tomatoes” by The World’s Healthiest Foods. It’s really encouraging me to use tomatoes more regularly in my cooking. Sometimes I just eat them raw, mix them in salad or cook them in soup. Sometimes I cook tomatoes with egg, sometimes with meat. Here’s one of my family’s favourite dish of tomatoes, Chicken in Tomato Sauce. When it comes to cooking tomatoes in Chinese way, I like to adapt my mother’s method, adding brown sugar slab (aka brown sugar in pieces 片糖) to make the sauce. The kind of brown sugar would balance the sour taste of tomatoes and produce fantastic results. Rinse chicken and drain well. Slice crossways into thin 4cm (1 1/2 inch) lengths. Mix with marinade for at least 10 minutes. Cut tomatoes into chunks and spoon out seeds inside. Rinse and drain well. Heat 2 tablespoons of oil in a hot wok (or saucepan). Add chicken and cook until brown. Set aside. Add some oil in wok, sauté minced garlic until aromatic. Add tomatoes, sprinkle a dash of salt, and briefly stir fry. Pour in water, add sugar, ketchup and stir well. Cook until tomatoes softened, but don’t overcook them. Make sure the sugar completely dissolves well. Toss back chicken. Add thickening and cook to the consistency you preferred. Dish up and serve hot with rice. 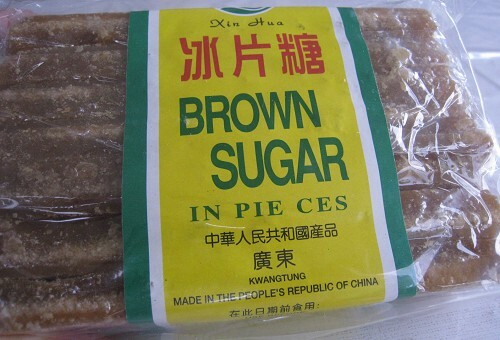 Brown sugar slab is available at Asian grocers. This looks great, on my recipe list for next week!! That's a very lovely dish to go with rice. My children will only eat tomatoes if I chop them up to make spaghetti sauce. I love to eat cherry tomatoes raw. They are so sweet and nice. I never realized tomatoes were so good for you! 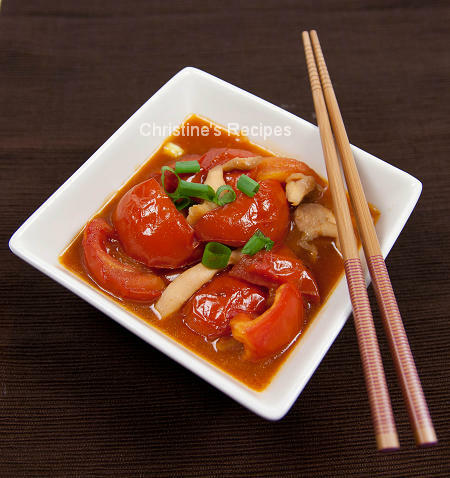 I never really associated chicken in chinese food with tomatoes but thinking about it - what a great idea! What a great idea! I cook a lot of stews and soups with tomatoes. Good for you and taste good! It's funny - when I think "Chinese Cuisine" I don't think "tomatoes". This looks awesome. Yum. Tomatoes are best in summer. Great use of it. Yummo. Yummy Christine. I love this. It's so colorful and I could taste the juicy tomatoes and the flavorful chicken. This sounds excellent, I like the use of brown sugar! Oh my, this looks tasty, what a yummy hearty dish. Thanks for sharing. I like the tomato addition and it is perfect for a winter night. This dish looks appetising. Reminds me of what we have here, a Malay dish, 'Ayam masak merah' which literally means 'Cook red chicken'! Also with tomato but a bit spicy. Christine, I love your recipes. They're exactly what i was looking for - I stumbled across your mango pudding recipe in a google search, and I made it straight away. My housemate, who is from Hong Kong, absolutely loved it. We are hanging to try your tofu fa as well. I hope you don't mind if I blog about some of your recipes, with an appropriate link? I love Chinese cuisine because of its sweetness and superb taste. I'll include this recipe in my compilation other than my own canning salsa recipes. Happy cooking! This is my favourite dish from my take away and your recipe is even better. Can't wait to make it again.